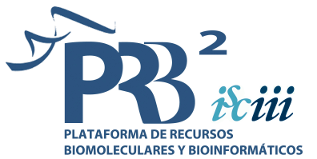 PRB2 is a platform of the Ministerio de Economia y Competitividad of the Spanish Government, of which structure comprises three technology platforms: Proteo-Red (proteomics), CeGeb (genomics), INB (bioinformatics), and two biobanks: BNADN (DNA bank) and BNLC (Cell lines bank). It entangles different complementary disciplines that allow the efficient management of complex investigations in biomedicine. INB is a technological platform of the Carlos III Health Institute (ISCIII). A National Network for coordination, integration and development of Spanish Bioinformatics Resources in genomics and proteomics projects. The Rare Diseases CIBER is one of the nine public consortium's set up at the initiative of the Carlos III Health Institute (ISCIII) to act as a reference, coordinate and foster research into rare diseases in Spain. The MINECO supports research initiatives in Spain. NaGen is an initiative of NavarraBiomed to sequence complete genomes of 1000 patients in the Navarra Community in which the Area of Clinical Bioinformatics is analyzing the genomic data to find disease causal mutations. MLPM is a Marie Curie Initial Training Network, formed by a consortium of several universities, research institutions and companies located in Spain, France, Germany, Belgium, UK, Switzerland, Israel and in the USA. It involves the predoctoral training of 14 young scientists in the research field at the interface of Machine Learning and Medicine. Its goal is to educate interdisciplinary experts who will develop and employ the computational and statistical tools that are necessary to enable personalized medical treatment of patients according to their genetic and molecular properties and who are aware of the scientific, clinical and industrial implications of this research. Supports research coordinated projects about cancer between several research centres in Spain. Atos designs, implements and runs internationally renowned solutions for public and private sector organizations alike, that transform information systems into positive drivers for excellence, differentiation and value-creation. ELIXIR unites Europe’s leading life science organisations in managing and safeguarding the massive amounts of data being generated every day by publicly funded research. It is a pan-European research infrastructure for biological information. ELIXIR was invited to apply to a dedicated call within Horizon 2020 following the ESFRI and European Council decision in 2014 to categorize ELIXIR as one of Europe’s three priority new Research Infrastructures. ELIXIR-EXCELERATE represents ELIXIR’s submission to this Call.